Discussion in 'Movies' started by ClassyCo, Mar 15, 2017. From looking back over Joan's career... she was the flapper girl in the 20s, the romantic lead (think a more serious Julia Roberts/Sandra Bullock) of the 30s.. and when she hit her mid 30s decided to work on becoming a character actress instead of doing shop girl/ romantic comedy pictures. She hit pay dirt in 1945 with Mildred Pierce that carried her career into the mid 50s before she got saddled with b level soap opera films of the late 50s. Sadly, her comeback in 1962 didn't result in quality films after that.. but she had always said that no matter what she got as a movie, she acted in it as if it was the greatest work of art ever. 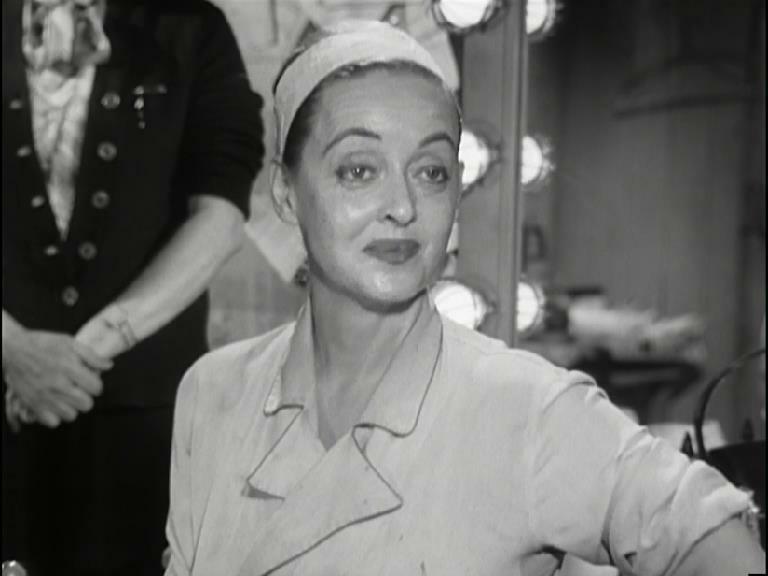 While I do think she tried to sabatoge Bette winning the oscar for Baby Jane, I truly think she shouldn't have wasted her time because Bette would never have won the oscar anyway. Anne Bancroft was flawless in the Miracle Worker and didn't chew the sets like Bette did as Baby Jane and later as Charlotte. I much liked Bette better in the Nanny where she was more sinister and not so over the type. Crawford laughing at the Duke's inadequate genitalia, suggesting an Oscar would better do the job, the viper. Well wasn't he really called Mary or Francis or Mary Susan Francis Feminina? Oh, that's right. His birth name was Marion. Heh. Yes, definitely. I SAW WHAT YOU DID is still disposable, even though the production values easily supercede those of S-J. Maybe I wouldn't say "disposable," actually -- at least I SAW WHAT YOU DID presents a cozily idyllic, B&W semi-rural alternative reality at midnight, what with the split-level house on a hill in the middle of a really cool farm... and Castle even uses a very effective fog in the latter scenes which makes me wonder why none of the other grand dame guignol pictures ever did that -- not even CHARLOTTE. due to a lack of any real creative vision. But why oh why was STRAIT-JACKET, perhaps the Castle production with the most potential, one of his very worst films? The direction, camera work, set design, script, editing is just all so crappy the movie is ruined... And Castle wanted this to be his crowning glory??? But I really do wonder that if he'd gotten Joe Biroc to film it (as he did for ISWYD) if STRAIT-JACKET could have been somewhat saved. Anyway, despite not getting enough screen time, the Crawford we get in ISWYD is almost the ultimate Crawford ever captured on film -- the one which could have crowned her own glory had she instead displayed and not extracted it from CHARLOTTE where she was dressed and photographed exactly the same way. Does anyone know who is singing this version of "Hush... Hush, Sweet Charlotte" near the end of the video? I would love to have the whole version of the song! Sounds like Patti Page -- or a close facsimile -- she had the 1965 hit song of it, done all period cascading strings-y. because I never belonged to anything or anyone else. I've found a seller on eBay selling some old movies, some in the public domain and some not. They are all very cheap and there are a few Crawford, Davis and even Stanwyck and Hayward films that I haven't really heard of. Is Bette Davis' THE STAR any good? Yes, THE STAR is not bad -- it's essentially Davis playing Crawford. The writers had been friends with Joan, and, feeling betrayed by the content of the script, Joan whisked off their daughter and the guy she wanted to marry (but of whom the parents didn't approve) and got them married, for spite. But the joke was on Crawford as the marriage was a happy one and lasted for decades. IMHO it is, because of everybody involved, and closer to reality than one would think. 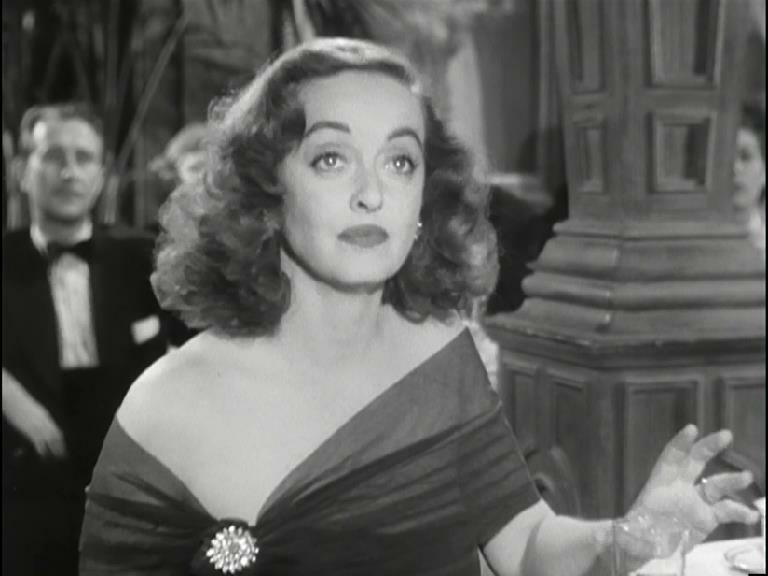 As you must know, it´s allegedly inspired by Joan Crawford´s later career*, and Bette pulls another big performance, more realistic than her best-known roles. 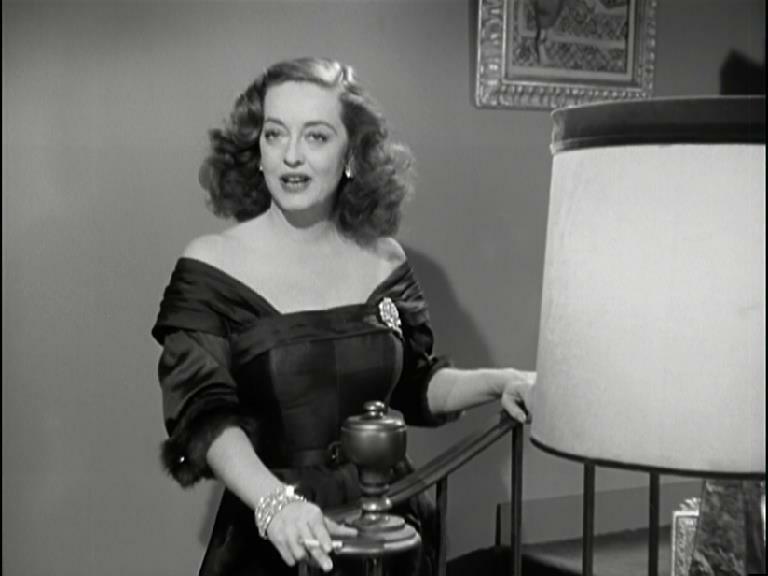 It´s not "All About Eve", probably because of its low budget and its mediocre director. A very young Natalie Wood plays Bette´s daughter (and again, she has to act by the sea and in a boat...). 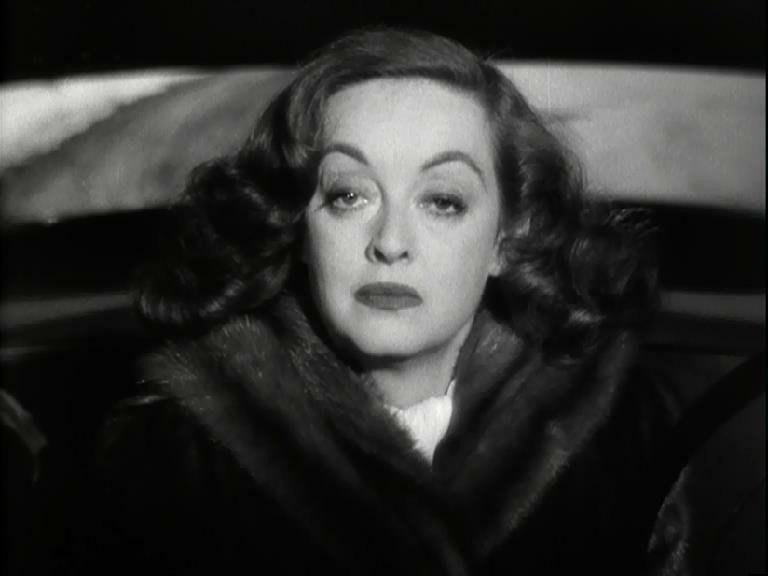 "Bette Davis reported that she modeled her performance as the aging, has been, drunken 'star' actress in the film after Joan Crawford, a real actress who was Bette Davis' contemporary, competition, and a lifelong enemy which she publicly ridiculed throughout both their careers; to what extent this is true could be argued, but there's no question about her wearing the famous Crawford ankle strap shoes when she views her disastrous screen test." Oh and the writers were friends of Joannie. Who, of course, after the release of this movie, finished the friendship right away...Just another omitted chapter of "Feud". 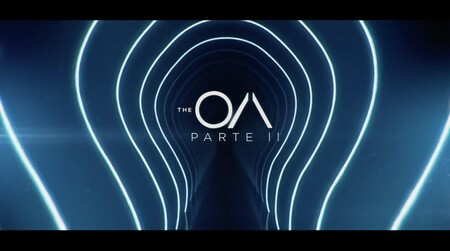 It´s not over-the-top or campy, but thoroughly enjoyable!! I still haven't seen every minute of FEUD, but while I can accept -- and almost believe -- Susan Sarandon as Bette, poor Jessica Lange really struggles, and largely fails, to evoke Crawford in any convincing way. I still haven't every minute of FEUD but while I can accept -- and almost believe -- Susan Sarandon as Bette, poor Jessica Lange really struggles, and largely fails, to evoke Crawford in any convincing way. That was my feeling on Lange as Crawford, she was too overtly bitchy and openly dark. I have always thought of Crawford to be too self conscious for that. That she would mostly parade a façade of sweetness and light then flip a switch into demented demoness drunkard when nobody that mattered was around. She really nailed it as Bette Davis, I just wish they would release Feud on DVD. And yet wishy washy, with little of Crawford's … ummmm…. focus. I think Bette was the better actress and i liked her sense of humour, I like Joan but simply for the story told on Mommie Dearest, I bet she was every bit the diva. I've seen this documentary a time or two. I actually have it downloaded on my laptop. In concerning Joan's treatment of her foster children, that's something we will never know the entire truth to, I'm afraid. Christina's stories, while containing some percentage of truth, are more than likely fabricated in some manner or another. Of course, some of Joan's contemporaries allegedly witnessed some "abuse", but I'm sure some of them might have only said so because the weren't her biggest fan, or quite simply to get their name in the papers. On the other hand, several of her friends deny any sort of misconduct. All people have people that paint pretty pictures about them, while others lead you to unflattering images. And Joan was no different. Indeed, she was probably worse off because she was a film star. When it comes right down to it, all the stories (whether "good" or "bad") are probably fabricated, if not entirely false altogether. I have no doubt in my mind that Joan was an abusive and torturous woman to her adopted children. She liked a drink and I have had experience with alcoholics in my life. They can be the loveliest sweetest people one minute then be a raving demented demon the next. They suffer with ludicrous jealousies and mostly buried insecurities that all come to the surface when drunk. And the rage! Was Joan like that all the time? No... I don't think so. She was likely loved by her friends, and considered kind and generous and lovely. She was likely a good mother a lot of the time too. Her intentions were probably mostly right but I would say there is a lot of truth in the abuse. It depends on perception too. People can live through same experience and look back on it in entirely different ways. Oh, but now we're told there is no limitation, you see. I mean there were always little tribes of people who claimed such foolishness--you know, God is in His glory and all is ours--but now this belief has gotten into the water supply and the bloodstreams of quite a number of people. It's asinine! Of course there is limitation. Of course there are things we cannot do. This is our first enemy, our first lesson. The limitations we possess are the first things we must destroy, or we will never get better. We have to own our limitations, our weaknesses, our faults, and then we have to overcome them, destroy them, and move on. There will always be another one to conquer, but oh, the joy when you kill those first few! Heaven! She lived both on and for struggle--she adored a challenge and felt purely alive when she was in the battle to vanquish it. And, oh, the joy when she succeeded, and for years so many people allowed her to believe that she always succeeded. She was indomitable; she was impossible; she was fabulous. She was out of her element on [Night of the] Iguana. If she had ever truly had a command of her talent on the stage, she had lost it by that time. There was ever any doubt that she could command a sound stage, but she seemed lost working on a play; she seemed small, lost. Of course this made her terribly angry, so most of what we saw was the virago, railing about the set and the costumes and the audiences: She both wanted for them to love her and want to see her, but would then chastise them for being stupid fans who weren't there to appreciate my play. 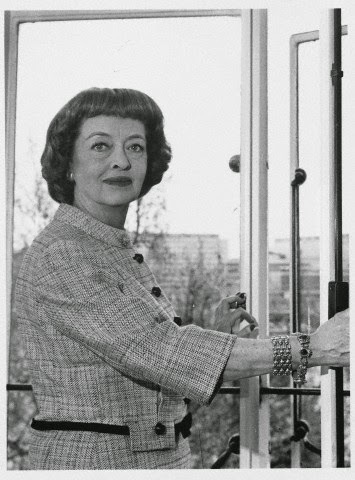 Davis also could not help perpetually thinking of her investment in the play: At Warner Bros., she would always begin, she could work for four to six weeks, and at the conclusion of that time, she would have a Jezebel or a Dark Victory or The Letter to show for it: a completed project, featuring her, ready to sell, ready for applause. On a play, you put in two, three months, and all you have is the same play, but you are, one hopes, perfecting the performances, helping your fellow players perfect their own performances. This was insufficient to Miss Davis. 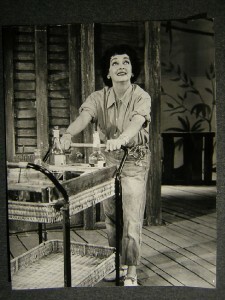 As Maxine in The Night of the Iguana (1961). She had no respect for the director [Frank Corsaro], but none of us did: He was not up to the task. Bette claimed that the Method, or rather its practitioners within the play, sabotaged her, but there was none of that: Patrick O'Neal was far too lazy a student of any acting style to have used it to such a degree as to distract, and Margaret Leighton--sublime, peerless--was simply a great actress perfectly cast. No one had time for Bette, and this drove her insane. Everyone was there to work, to perfect the play, and no one had time to see after Miss Davis. She hated her dressing room, which like virtually all theatrical dressing rooms was shabby and small and uninspiring. I think she felt at that point in her life, she was at some sort of end point, and it would end up in a supporting role in a play in a shabby dressing room. I liked her and spent time talking to her, but all she wished to discuss were other actresses. She adored bitchy gossip! She trashed Tallulah [Bankhead] endlessly, and ended each story with a statement: 'Well, I certainly triumphed in that case.' Winning was very important to Miss Davis. She felt she and [Anna] Magnani were compatriots, but all they had in common, really, was temperament and a healthy libido. Davis craved Jimmy Farentino, as did we all: He was a marvelously beautiful man, and he enjoyed walking about the premises in next to nothing or nothing. Bette seethed with lust. Bette endured in the belief that she might have a chance with this young stud, and it was very charming to watch her flirt with him, to offer advice, to invite him to her shabby dressing room to discuss the business. In retrospect I think Jimmy would have given her a go, but Miss Davis, a believer in astrology and Yankee etiquette, could never bring herself to ask for the favor. She could never bring herself to ask for anything--she loved to demand, to rail. 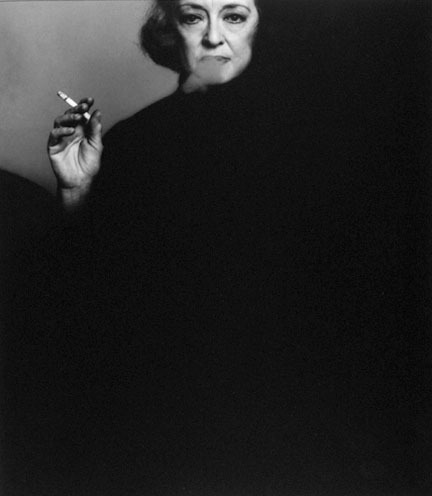 I wanted her to be great, but she was not: She was Bette Davis, slumming in a play. To my amazement she would look out over the audience, counting the house, making no attempt to be in character unless she was speaking. I was, shall we say, disappointed. And then she left the play. 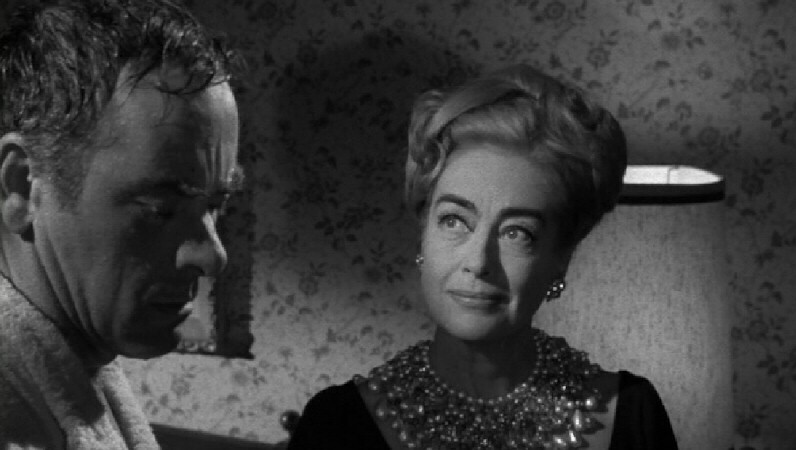 I continue to enjoy Miss Davis through her films, and through those other great performances she gives in interviews, during which she gives the impression--false, in my opinion--of a smart, decent, upright lady. Better, in so many circumstances, to not meet people you admire. It was not a happy time, and I was terribly disappointed--not in Tennessee Williams, who wrote a wonderful play, but in everything else. Everything else! My God, I got no help at all from anyone. I was led to believe that [Elia] Kazan might direct, and I found this terribly exciting, but he was not available or he was not interested, and I got someone totally terrified and not at all helpful. And that cast! If I got five words out of Mr. O'Neal or Miss Leighton, it was a miracle. There was no camaraderie, no sense of kinship, no attitude of pulling together to make the play work. I came from the stage! I am a stage-trained actress! Of course I knew how to act for the stage. What I did not know or understand or give a damn about was Patrick O'Neal's motivations to sit or stand or look at an imaginary moon! Miss Leighton was another story--she was not so much Method as totally absorbed in herself and her part. She wouldn't look at me on the stage! She ignored me backstage! I might as well have been a rodent who crawled into the theatre! I didn't need that, so I left, even though it killed me: I am not someone who leaves a play or a film; I am someone who masters the problem. 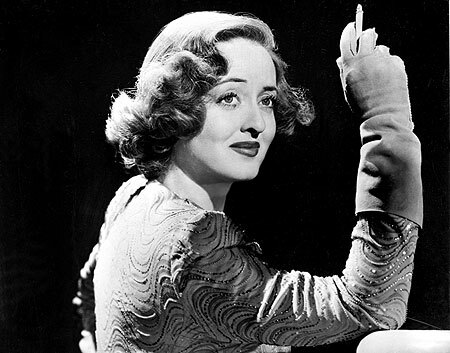 I had no choice--I needed to support my family and I needed to do work that I loved and that meant something to people who want to see Bette Davis. I always wanted to play Amanda Wingfield. As in so many other instances, Katharine Hepburn beat me to it. I was in my early fifties during the time of Iguana, but I could have pulled off Amanda on the stage, perhaps even film. Tennessee kept saying that Amanda is truly about forty-five, but they keep getting older and older! Did you see Hepburn in that thing on TV? She looked seventy! Precisely how old was she when she had those children? I really should have been doing something like Menagerie on the stage, not a supporting role in Iguana or anything. That was my mistake. I thought it would be good for my career. You know there would be no Jo Van Fleet if it weren't for me? My dear, every decent part she ever had was offered to me first! Kazan wanted me for East of Eden, but I didn't fancy playing a cameo, even if it was such a good part, primed for awards. I chose to play a leading role instead [in The Virgin Queen]. Then I was offered the mother in Look Homeward, Angel on the stage, but I broke my back, and that was off. Then Paul Newman wanted me to play his mother in Cool Hand Luke, but I didn't want to do a cameo. Jo got all of those parts and quite a few awards. I might be sitting here with two supporting Oscars to sit beside the leading Oscars, but I don't have time to think about right choices or wrong choices. I was always the first choice for the roles I played. I don't want to be a stand-by actress, like Faye Dunaway. One is not a star if one is not sought after, written for, demanded. Miss Dunaway has never been anyone's first choice: she has been cast primarily because Jane Fonda has not been available. She is an accidental star, and I don't want to be that: If I thought I was such a thing, I would find some other line of work. I do believe that professionalism is dead. The working situations I find today are ludicrous! There is so much waste--of time, of talent, of money. I worked like a demon all those years: You're looking at talent and sweat when you look at my work, but today there is very little work on the parts: the work is in the deals, the contracts, the publicity, and then a vacuum shows up on the screen or the stage. I see very little that interests or impresses me these days, and this makes me very sad, because I love the theatre and I love films. I don't think I'm an angry old lady, complaining about things and feeling left out. I have a body of work and a history that I think merits attention, and I think my opinion means something, and I think the work coming out now stinks! There is no individuality in the actors or the films. Why? What happened? This project you're on--finding Tennessee's women and talking to them is good, but it's sad. All of those women you've mentioned--there will never be a list of names like that again. Good luck to the person who dreams of a life in the theatre in another ten or twenty years. Who will they write to for help? Who will they wait in line to see? Who will they conjure in thought to create a character? It's very sad, I tell you. It's over. I really think it's over. I honestly think that we will no longer go to theatres to see films--they'll be shown entirely on televisions now: on cable or video recorders. This is horrible, I think. I think films should be seen on a big screen with an audience, and I think you should get together and get dressed and sit with that group and give a damn about what happens. I think you should go to the theatre to see great plays about great ideas, cast with people you want to look at for two hours, creating characters who are interesting and larger than life. You know I went to a restaurant the other night, and they were lovely to me. They gave me a bottle of wine; they sent me flowers. It was really lovely. A thank-you for all the work and the sweat and the memories. The host of the restaurant came to me toward dessert and asked if I might come with him to the kitchen. I went, expecting to thank the chef for a lovely meal, but instead I was shown to a dark section of the kitchen, where a young man washing dishes was introduced to me. Taped above his sink--this awful slop sink--was a photograph of me, quite stained and curling, I might add, but still lovely. This young man was an actor--he was studying to be an actor--and that photograph was his inspiration to keep washing the dishes, to keep studying, to keep auditioning because something like me, something like my career might happen for him. I was terribly moved, as you can imagine, and I was delighted to meet this young man. Now, really, who in God's name is around today who would be plastered above a sink and could serve as a dream for anybody? Now really! Tell me! And that is sad. Very sad. 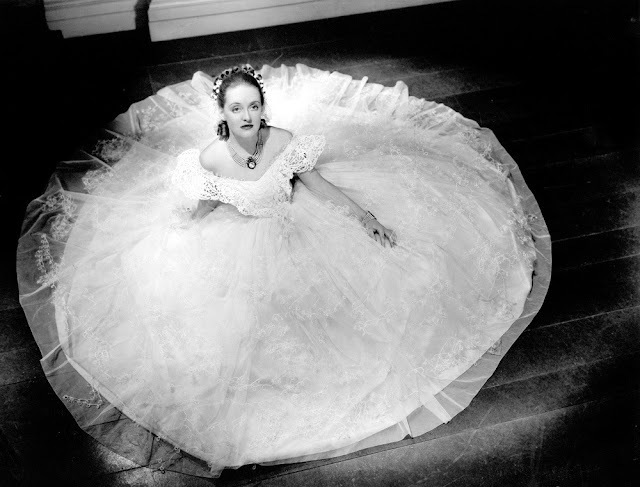 Bette Davis as Jezebel (1938).